Get blissfully marooned this summer on one of Australia's many caravan-friendly islands. There’s a lot to love about Moreton Island. From its vast swathes of stunningly white 4WD-friendly beaches to its pristine waters abundant in marine life, this island has something for everyone. Best of all, it’s located just 40km from Brisbane via a vehicular ferry. The island’s east side enjoys fabulous surf breaks and great beach fishing, while its protected west side – facing onto Moreton Bay – offers calm water for swimming and snorkeling at the iconic Tangalooma wrecks. Here, dolphins come to the water’s edge nightly, delighting kids big and small. The beautiful Cape Moreton Lighthouse is a colourful sandstone structure and one of five lighthouses on the island. Island visitors need a 4WD, an off-road caravan or camper trailer and basic sand-driving experience – there are no sealed roads here. 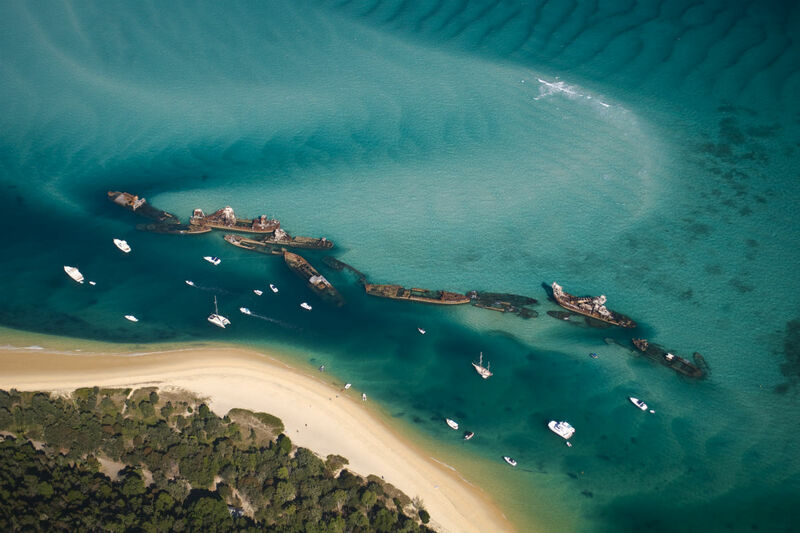 Indeed Moreton Island is hailed as a mini Fraser, a fitting comparison given it’s the third largest sand island in the world at 38km long and 8km across at the widest point. It’s home to the world’s highest coastal sand dune, the 280m-tall Mount Tempest. Needless to say, sand tobogganing is a popular pastime here. Kangaroo Island is a pristine wilderness area off the South Australian coast, just a stone’s throw from Adelaide yet seemingly a world away. Fringed by the turbulent Southern Ocean, its rugged 500km-coastline protects world-class national parks overflowing with endemic plants and inquisitive wildlife. Visitors can walk amongst Australian sea lions at the aptly named Seal Bay, cruise alongside migrating southern right whales (between May and October), swim with wild dolphins, watch little penguins come ashore in the evenings and spot koalas in the towering eucalypts. Kangaroo Island is laden with history, at times dark and mysterious. It was discovered by the English and partially mapped by the French in the first few years of the 19th Century, the two working together and sharing information despite the war that raged between their respective homelands. The island quickly became a lawless, self-sufficient society of seal hunters, runaway convicts and wayward sailors, before being formally settled and becoming Australia’s first free colony. Today, you can explore relics of the early European settlement at Reeves Point. Regarded by many as Tasmania in microcosm, Bruny Island offers pristine forests, wind-swept coastlines, sheltered bays, protected wildlife, wonderful culinary experiences and breathtaking scenery. Located an hour south of Hobart via road and ferry, Bruny is an accessible destination with excellent facilities for caravan owners. Choose from the seclusion of wilderness camping in South Bruny National Park or opt for caravan park comfort at Captain Cook Holiday Park at Adventure Bay. 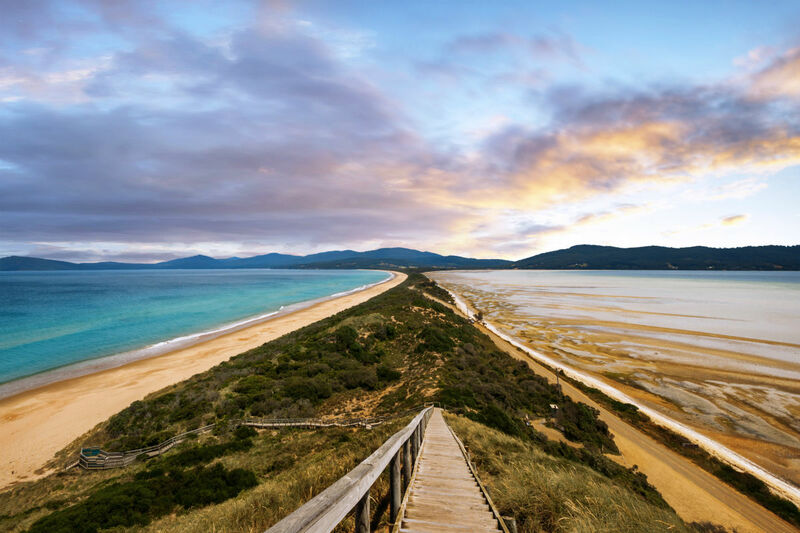 Bruny Island is blessed with incredible natural beauty, its most striking feature undoubtedly the 5km isthmus that joins the north and south of the island together. The island is a bushwalkers paradise, with excellent walking tracks taking in the sweeping coastline and forested interior. Visitors to Bruny can enjoy the island’s many culinary spoils, from both the land and sea. Bruny has a flourishing food and wine scene, with exceptional seafood, cheese, berries and locally reared meat on offer. Known simply as ‘Straddie’ to locals, North Stradbroke Island is a coastal playground just 30 minutes by ferry from the southern suburbs of Brisbane. At Straddie you can get up close and personal with marine giants, explore beaches by 4WD and enjoy a cocktail at a bar all in the same day. This wonderful mix of nature and culture, together with its accessibility, makes North Stradbroke Island an excellent option for caravan owners looking to envelop themselves in island life. There are options here for both on- and off-road adventure, so whatever your caravan and tow vehicle set-up Straddie has plenty to offer. The waters surrounding North Stradbroke Island are a safe haven for wildlife, making Straddie a popular destination for diving and snorkeling. Depending on the season, visitors can expect to see turtles, humpback whales, dolphins, leopard sharks and, most famously, manta rays. The latter are frequently spotted on dives during the summer months, with the dive site Manta Bombie consistently rated one of the best in Australia. 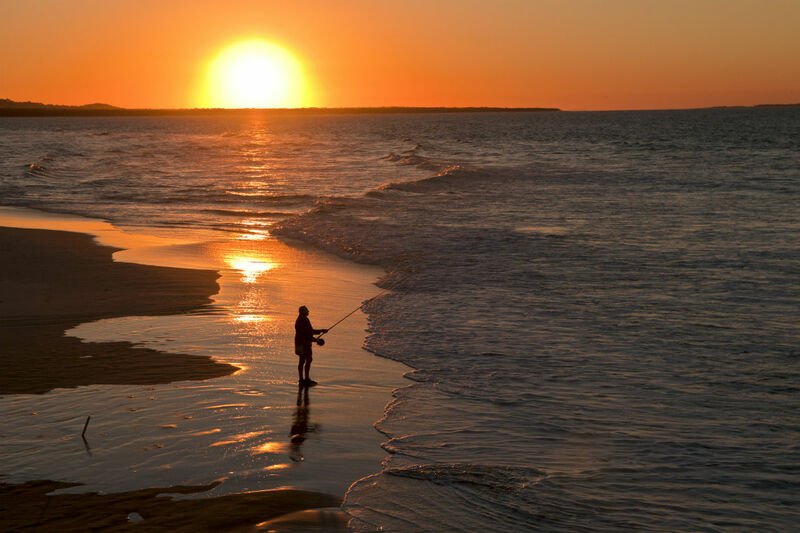 The fishing here is exceptional, too, from rock shelves and beaches to boat-based fishing on the flat waters of Moreton Bay and the open ocean off the island’s eastern coastline. 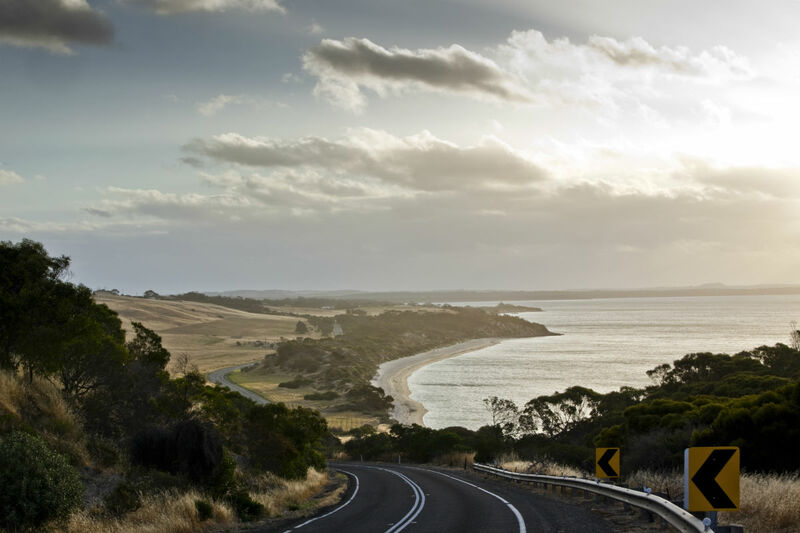 For those who prefer to be ‘castaway’ someplace with all the comforts of the mainland including sealed roads, great restaurants and excellent shopping, Phillip Island delivers. 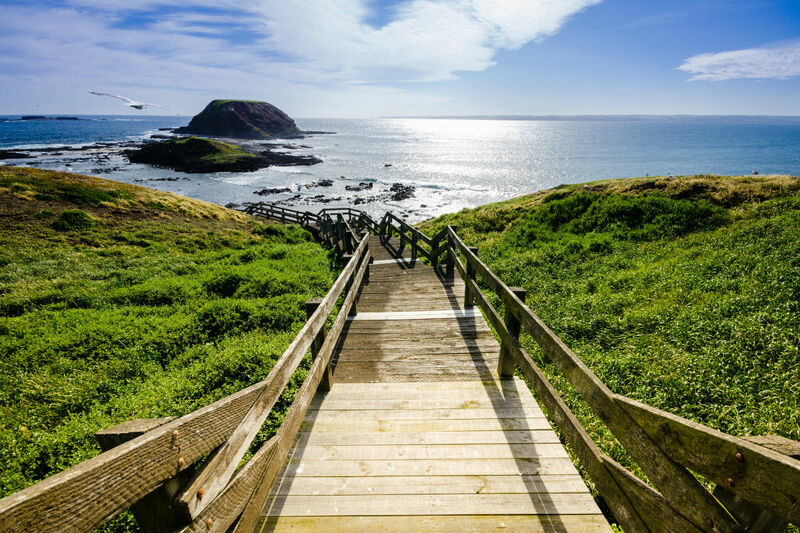 Located two hours southeast of Melbourne and fringed by Western Port Bay, Phillip Island is accessible via a bridge from the town of San Remo. With plenty to offer including cute seaside villages, rugged rocky beaches and headlands, dramatic coastal scenery and even a colony of fairy penguins, this 26km-long island is a natural wonderland where a burger with the lot and a hot cup of coffee are never far away. They’ll taste even better after a long surf on world-class waves in the chilly Southern Ocean. But the little fairy penguins are doubtlessly the main attraction here, waddling ashore each evening to take shelter in their burrows in the sandy dunes. They can be viewed from specialised platforms that allow visitors a chance to get up close and personal without disturbing the penguins.